Here you will find studies and journaling of my work with primarily western "Wild" plants and their uses for food, medicine, and tools. Get recipes...foraging book reviews...and listings of my upcoming classes. Enjoy! I had a palm tree that was planted way too close to the side of our pool. It started to crack the side and the tiles started popping off. Though pretty...and a great accent to the look of the pool...it was time for it to come down. Using my trusty pole trimmer I first took off all of the palm fronds...and then a chainsaw did the rest of the work. 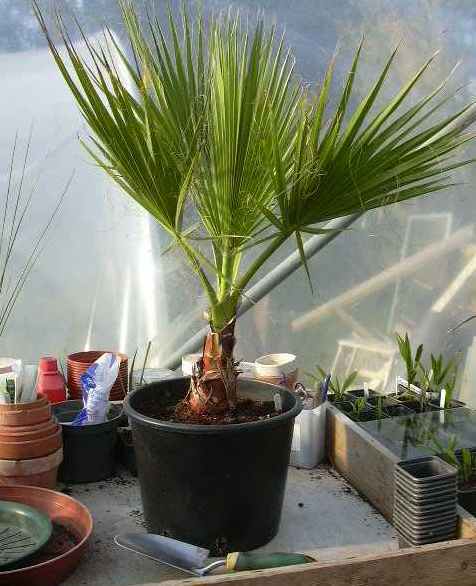 The palm that I took down is what is called the Washingtonia filifera or California Fan Palm. With all of the variety of palms one can currently see throughout California...one might think that they have always been here...but it turns out that the CA Fan Palm is the only one that is native to the west. Check out the two links for ID info and other facts. Basketry material...fibers for cordage...windproofing and waterproofing shelters...stirring implements...and so on. Which can be eaten fresh...made into a drink...ground seed and all into a flour...etc. I have yet to eat any...as the squirrels where I live always eat them first...and the my tree that produces them is probably 25 feet tall making harvesting very difficult. The flavor of which is mild...and yet distinctly palm flavored. It has a good crunch to it. It can be eaten raw...boiled...fried...whatever. It also has some nutritional value. I have eaten the heart of a tree 13 feet tall (the one I just cut down) and I have also eaten the heart of one the size shown in the photo. If you have never seen a heart taken from a palm...it is the part nearest to where the young palm fronds are coming out of the top of the tree...right in the center of the tree. The growing part. The heart I extracted from the 13 foot tree was probably a couple of feet long...while the one from the tiny tree was under a foot. To get the heart out of the large palm...I cut down the palm and then worked my way up the tree...cutting cross sections (a chainsaw made this quick work but it could be done with other tools)...checking the core of the tree to see if it was fibrous and hard...or soft and whitish. When I found that it was soft...I cut the tree lengthwise about a quarter of the way through...and pulled out the soft core. After snacking on a good chunk of it right out of the tree...I went ahead and cut up the rest...sauteed it in a stir fry...and had it for dinner! Yum! The leftovers were a welcomed additional ingredient in taco soup. Chances are...you don't have a bunch of these trees around that you can cut down for the heart. Chances are also that even if you had one...you wouldn't cut it down because it is a pretty tree. Perhaps it makes you feel like you are on an island vacation! More likely will be that you can find "volunteer" trees like the one in the photo that have popped up and are ready to be processed and eaten. These small trees do not require a chainsaw...and can be processed with a small hatchet...or loppers...or by someone who is knowledgeable with how to use a pocket knife. My squirrels...while they don't save me any of the fruits...they do regularly unwittingly plant these small palms as they drop the seeds from the top of the tree. As these seeds find their way into the soil...they spring up all on their own...and voila!...a great meal for my family! If you want to try palm hearts before expending the effort of self harvesting...you can always pick some up in a jar from your local grocer. Still...it can't beat fresh hearts that you harvested yourself! Never eat anything that you have not identified with 100% accuracy! Never eat anything that you allergic to! Do not use this site as your one definitive source and check other reputable sources before consuming any wild edible! Check Out My Preparedness Blog!! Jan-May 2011 - Classes for the City of Folsom Parks and Recreation at the Hinkle Creek Nature Center. The worlds bounty is "Sacred" as it comes from God and should be used with reverence. It is a "Garden" that requires our tending if we are to ensure that it will produce good and plentiful fruit in the future.